Partnerships were designed to improve participation levels, student engagement and Year 12 or equivalent attainment. Career Links worked with key stakeholders to identify the needs of our region, help partners to agree on how they could work together towards a common purpose, and support partnerships to achieve their goals. This program introduced Year 9 and 10 Indigenous students to various work places and provides them with necessary skills to apply for a position and ace an interview. The students identified to participate were particularly focused on pursuing a School Based Traineeship in 2015. Schools: Cardiff High School, Maitland High School. Business: AES, Westpac, Job Centre Australia. The program provided opportunities for young people to view the world of work in a meaningful way, demonstrating career options that are genuinely available. It also enabled participants to develop practical strategies to confidently approach applying and interviewing for a job. The program offered students the opportunity to visit a local radio station and look at a range of careers provided in the multi media sector. The tour included the opportunity for the students to see firsthand what it was like to work in a radio station. They were given access to the studios and even a tryout at some of the skills needed to be radio presenter. It was a great experience for the students who met with staff who explained the type of work program-makers and journalists do, as well as the technical aspects of running a radio station. Schools: Hunter Sports High School, The Big Picture School. Business: ABC Radio, 1233 Newcastle. The young participants gained a better understanding of not only the types of jobs available in the industry, but also the various pathways the staff have taken in their own careers. The partnership aimed to support wellbeing in school communities and improve educational and social outcomes for young people. Schools: Kotara High School, Newcastle High School, St Pius X High School. Service Providers: ARAFMI, Headspace Newcastle, Hunter Institute of Mental Health, Hunter New England Health, Lifeline. The partnership assisted staff in schools to better connect with Mental Health service providers. It is also supporting professional development and learning opportunities to raise awareness of mental health and reduce the stigma of mental illness within the community. Address uptake of Chef Apprenticeships. Increase skills and inspire young people. Increase parent interest in career planning by involving them in information sessions. Provide work experience/ work placement opportunities for young people. 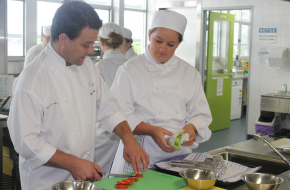 School retention and engagement in hospitality career pathways.